We, at Scott’s Fireplace Products, feature the Campfire Vented Gas Log by American Gas Log (found in their Best Fire Series), truly has more to offer combining luxury and quality with technological design achievements. Intricately detailed logs are each hand-painted with natural bark patterns reflecting the rugged distinction and variety of natural logs. The Ever-glo ember bed enhancement system provides glowing embers at the heart of the fire for a brilliant flame, as well as, a tremendous amount of radiant heat unmatched by any wood burning fire. Best Fire’s clean burning burner system allows you to enjoy a beautiful fire for only pennies an hour. The convenience of this gas log means no ashes, no sparks, and virtually no air pollution. Whether your logs are burning or not, they provide genuine fireplace elegance inspired by nature all year long. The greater majority of vented gas logs utilize a sand-pan burner, which has been the industry standard for more than fifty years. The Fiber Glow Gas Log created a state-of-the-art burner system by incorporating innovative new technology called the Fiber Ceramic burner. 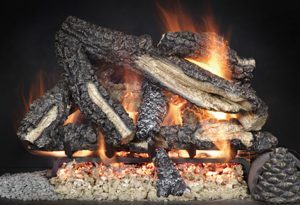 The Fiber-Glow is a high-quality fiber-ceramic log that has outstanding radiant heat qualities, a realistic mature fire and is very fuel-efficient. This design burns so hot it produces a secondary stage of combustion which prevents carbon build up, which is typical with most all other vented gas logs. Vented Gas logs are designed to operate in wood-burning fireplaces that have a minimum of an 8” flue and the damper open.